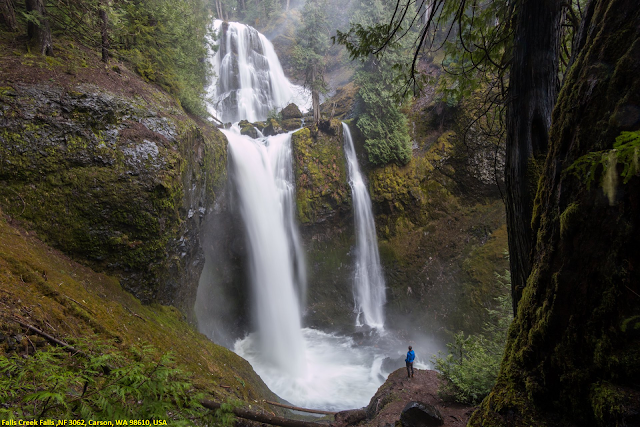 Falls Creek Falls hike through the Gifford Pinchot National Forest leads to a 220-foot, three tiered waterfall. Beginning at the end of Road 3062, this trail follows Falls Creek, climbing through a 30 to 60 year old forest for about 1 1/2 miles. A cable suspension bridge spans a rock gorge providing spectacular views of the white water of Falls Creek. Continue uphill for 0.7 miles, crossing a creek, to the base of the waterfall. Be prepared to get wet! The creek can be deep in the early seasons. Best time to visit -: May - Nov.